With more than 50 years in the business, Calphalon is a leading brand in the cookware and cutlery industry. Part of what makes their knives so appealing to consumers (ourselves included) is that they’re highly affordable – without sacrificing on quality. 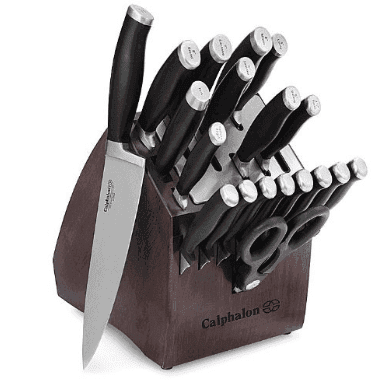 If you’re looking for a complete knife set, Calphalon’s 20-piece set is a great choice. Just about every knife you’ll ever need for home cooking is included in this set. But having a variety of knives to choose from is just the icing on the cake with this collection. The real benefit to choosing this set is that the knife block is self-sharpening. Now that’s a feature any cook can get behind. Built-in ceramic sharpeners are included in the knife block, so the knives are automatically sharpened each time you use them. Variety and sharpening benefits aside, these knives are of exceptional quality. All blades (with the exception of the steak knives) are forged with high-carbon German steel that’s non-staining. The steak knives are forged with stamped Asian steel. The full tang design of these knives offers exceptional balance and strength. They feel great in your hands, and they’re easy to work with. The handles also have another unique, brilliant feature: labels. Yes, the contoured, ergonomic handles of these knives (minus the steak knives) include an engraved label for easy identification. 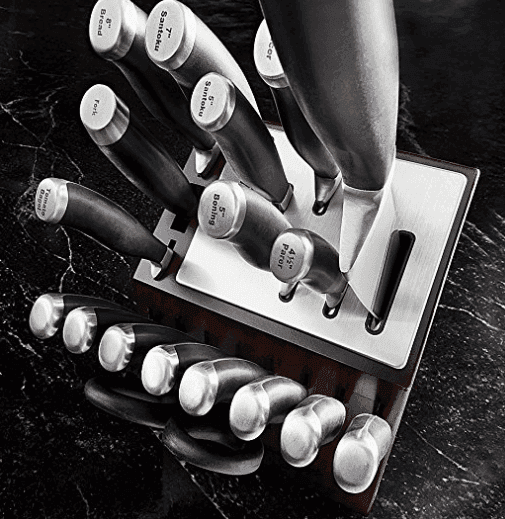 Calphalon’s 20-piece knife set is easily one of our favorite sets from this brand. The knives are comfortable to hold and work with, the labels are a nice convenience, and the self-sharpening feature keeps these knives extra sharp. The only slight drawback with this set (if you can even call it that) is that the self-sharpening feature does not extend to the steak knives. 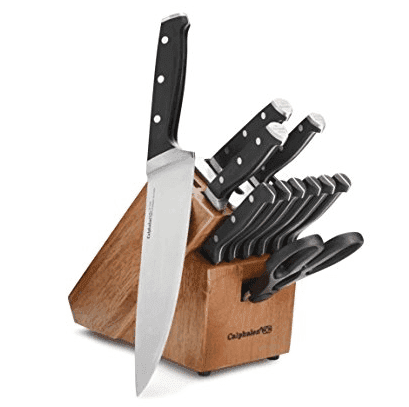 The 20-piece Contemporary knife set from Calphalon is our go-to recommendation for anyone looking for a complete knife set that will give them years of use. The 16-piece Precision Series set also offers great versatility and an attractive wooden knife block to store your new knives. While the block does not include a ceramic self-sharpener, the high-quality blades are designed to hold their edge. The included honing steel will help keep your blades sharp, too. All of the knives (with the exception of the steak knives) feature full-forged blades made of high-carbon German steel. The steak knives are forged with quality Asian steel. The chef knife included in the set. The handle is comfortable and well balanced. We love the bar-riveted handles and the full tang design. These knives are exceptionally balanced, and we’ve never had issues with breakage. Durability and quality is top-notch for this price range. Like other Calphalon knives, these have labels etched into the ends of the handles for easy identification. 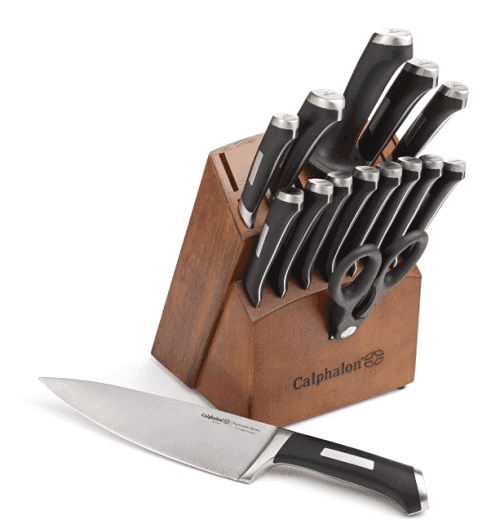 We were disappointed that this set did not come with a self-sharpening knife block, but Calphalon did include a honing steel, so you can still keep your blades sharp. It’s important to note that there are extra slots on the knife block, so you can extend your collection if you’d like. The empty slots are perfectly designed to fit the 7” Santoku knife, 7” slicer and the 4.5” paring knife, but you can choose other knives that are similar in size. Again, the only real complaint with this set is that it doesn’t have the shelf-sharpening knife block. But the included honing steel makes up for this, and the blades hold their edges well to begin with. We highly recommend the 16-piece Precision Series set for anyone who wants a solid knife collection and isn’t concerned about the self-sharpening feature. 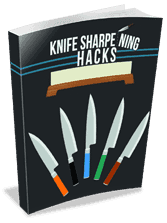 These knives have great balance, and when taken care of properly, do not rust or lose their edge. The Classic 12-piece cutlery set is an excellent choice for anyone who wants a quality knife collection with a classic wooden knife block. Like the 20-piece set, this collection also includes a self-sharpening block to keep your knives razor sharp. The built-in ceramic sharpeners sharpen the straight-blade knives with each use, and the attractive wooden knife block looks great in any kitchen. And these knives also have the convenient engraved labels, which make it easy to grab the knife you need and get to work. The self sharpening knife block. We love these knives because they feel balanced and they’re comfortable to hold. The triple-riveted handles feature a contour design that matches the natural curves of your hands and provides a secure grip. The high-quality blades are forged with high-carbon stainless steel and feature a full-tang design for added durability. All of Calphalon’s knives are backed by a lifetime warranty, so you can rest assured that your purchase is protected. The only gripe we have with this set is that a bread knife is not included. 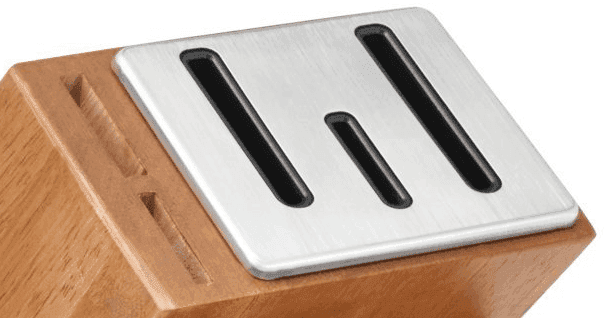 There’s a slot for it in the knife block, but you’ll need to buy it separately. While not necessarily a deal-breaker, it is a bit of an inconvenience if you don’t have a bread knife on hand. Overall, however, this 12-piece set is a great option for anyone who needs just a small knife collection. All the basics are included (minus the bread knife), and the self-sharpening feature will keep your blades sharp for years to come. The balance is great, and these knives cut through even tough produce like butter. Calphalon knives are known for their exceptional quality and affordable price, which makes them a great choice for home cooks. The only caveat with these knives is that you really must wash them by hand and dry them well. They are rust-resistant, but if proper care is not taken, rust spots will form. These three sets are our favorites because they offer convenience (self-sharpening and labels), quality (full tang blades forged with German steel), and versatility. If you can’t afford to buy a set of higher-end knives (or don’t have a use for them), Calphalon will give you nearly the same quality at a budget-friendly price.